A tale of two volleyball players, what defines a good player vs. a great player and how you can help your players become great? The sport of volleyball has undergone a wide variety of changes over the better part of the last decade: the scoring has changed, rules involving the net have changed, even the role of the libero has seen some modification. But the biggest change in regards to coaching the game of volleyball is what has become known as “reading the game,” (Introduced by Karch Kiraly) and the massive chasm in performance it can create between the players who do read the game and those who do not. Reading the game is exactly what it sounds like: Our ability to observe what is happening on the court, make an assessment based on the information, and adjust accordingly. What separates the best coaches and players in any sport is their ability to read the game and react to their observations. The basis of reading the game begins with the OODA Loop (observation, orientation, decision, action), and the difference between those who utilize it and those who do not is simple: The game either begins to speed up in pressure situations, or it slows down. The OODA loop, which was first introduced by retired Air Force instructor John Boyd, is described as “how humans respond to stimuli” and is currently the most proven and tested system to teach players and coaches how to read the game. After processing what we observe, we then move onto the orientation phase of the OODA Loop. Boyd described this as shaping “the way we interact with the environment. Hence, orientation shapes the way we observe, the way we decide, and the way we act.” It may, in some cases, be the most critical phase of the process. Now that you have observed your environment and oriented yourself to it, it is now time to decide what you’re going to do: Swing or shoot? Set the middle or the outside? Shot block or swing block? Which leads to the final aspect of the OODA Loop: Action. You have made your decision, and it is now time to perform the skill. It is not difficult to see that the two players experience very different circles. The player on the left experiences a much bigger – and therefore slower – OODA Loop, since it takes him or her longer to move between each phase of the OODA Loop. The game, then, will only seem to move faster and faster as the player will have less time to observe, less time to orient, less time to decide and even less time to react. 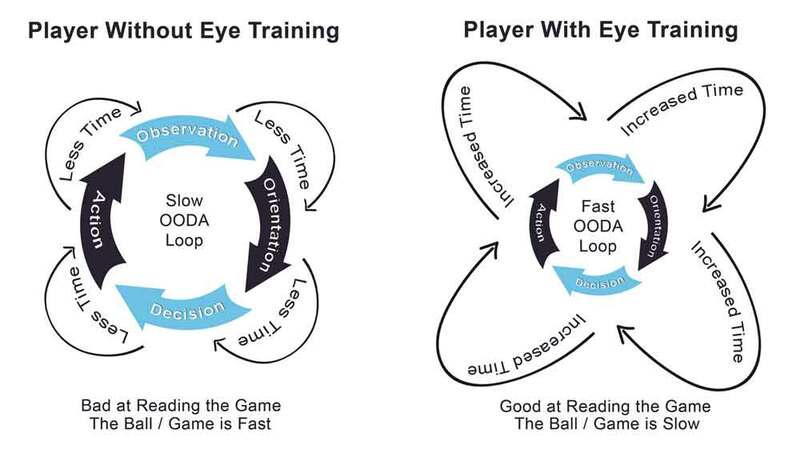 Everything will be rushed, inefficient, and not nearly as effective as the play of someone who has worked on “reading the game.” That player, meanwhile, will be experience the OODA Loop far quicker, which results in more time to observe stimuli, more time to orient, more time to decide, and more time to act. Every single component of the athlete’s game will be improved. At our Volleyball1on1 Camps we teach players and coaches the seven ways to increase the speed of your OODA Loop while slowing down the OODA Loop of your opponents, which will result in you being able to read the game more effectively, making it seem as if the ball and game are moving in slow motion. This is know is aerial warfare as OODA Looping Your Opponent. These posters are used by elite athletes around the world to help them. 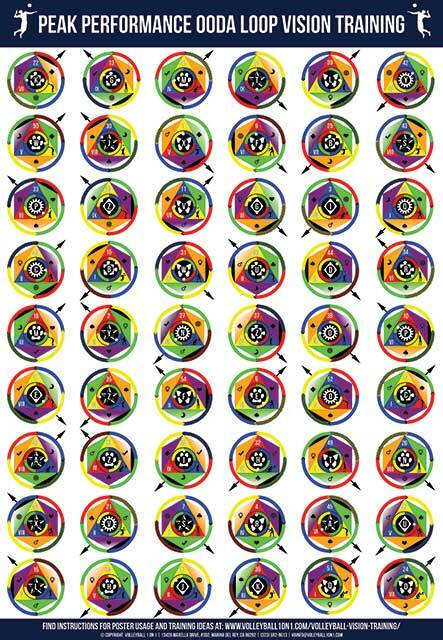 Track a moving object, while scanning between 1, 2 or more posters, while performing all 4 stages of the OODA Loop, while switching the “Visual field” horizontally, vertically or both, while “Maintaining a stable image on the retina”, while switching “Soft” to “Fine” focus, and only focusing visually on the task at hand, meaning “Centering” on only that which is important. If you would like our staff of trained coaches to come teach you and your players all seven techniques to “read the game,” schedule a call with Andor Gyulai. You can also find out more information about our volleyball1on1 camps here! For more resources and articles on the OODA Loop for Volleyball – Click Here! Go Here to watch videos of top USA volleyball athletes training with the “Peak Performance OODA Loop Vision Training Poster”.